Mauritania is now the 31st State Party to the Anti-Personnel Mine Ban Convention which entered into force in 1999, and is a disarmament treaty that prohibits landmine use, stockpiling, production and transfer. Since its beginnings, 164 States Parties have destroyed more than 51 million landmines and 158 States Parties have fulfilled their stockpile destruction obligation. Signing a commitment banning landmines appears to influence armed nonstate actors (ANSAs) away from the use of landmines, suggesting that deeds of commitment can influence ANSAs’ behavior. The same factor that may account for a government signing the Mine Ban Treaty—its previous non-use of landmines—may also account for its compliance with that treaty, suggesting that signing itself does not exercise any independent effect on state behavior. State and nonstate actors’ behavior with regards to signing and complying with humanitarian treaties should be viewed as interdependent, where actors make decisions based in part on what their opponents do. 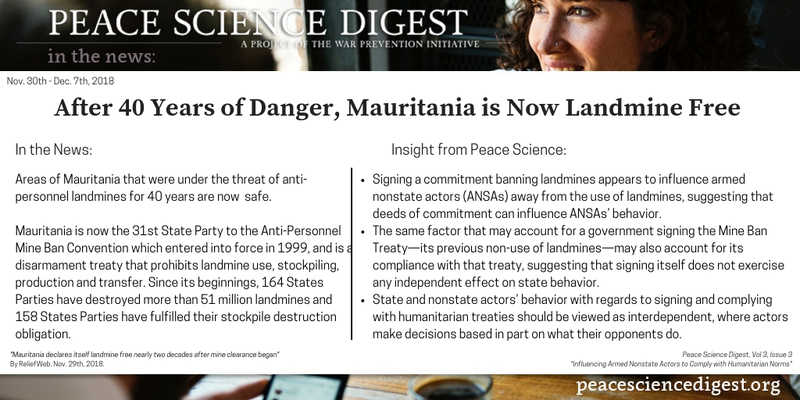 “Mauritania declares itself landmine free nearly two decades after mine clearance began” By ReliefWeb. Nov. 29th, 2018. Next article Gender Equality Isn't A "Women's Issue"